Who Doesn’t Love a Sale? I must admit that when I stumble into an unannounced 75% Off Sale at Dillard’s in Prescott, AZ that I cannot resist the urge to shop a little. It was last year – at the end of winter that I found the Italian wool car coat and the long sleeve, travel guide orange shirt. It was only this year when I wore that orange shirt that I began to appreciate how much much of bargain the comfortable, linen/cotton blend truly was. So I decided to wear it out to dinner. Guess Who’s Shirt is Coming to Dinner! I do a lot of pro bono photography and videography work for local Yavapai College. It’s my way of contributing to Yavapai County. And in so doing, I have become quite fond of the people with whom I work there. So when I was invited to dinner with a few of my foundation and marketing friends, I was thrilled to go. I Don’t Need No Stinking Advice! When I was developing the images, I saw it. 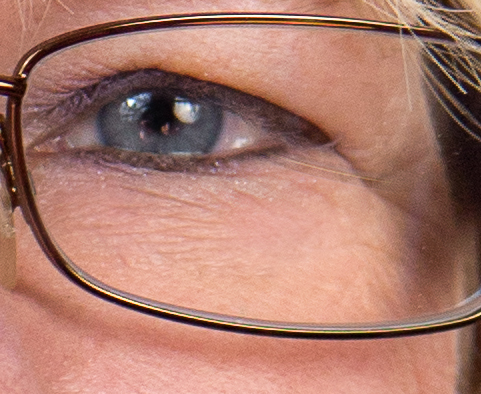 ‘What is that interesting quality in her eyes?’ I zoomed in closer … closer.